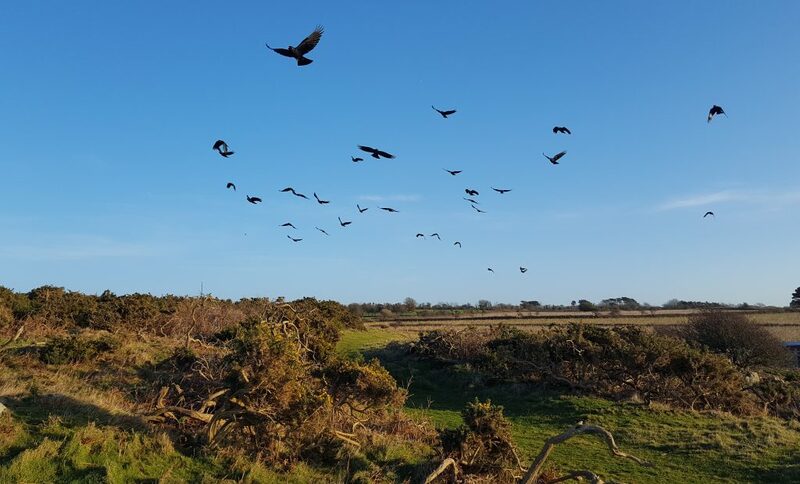 As the year drew to a close and daylight hours dwindled to their annual low, the choughs spent more and more time at Sorel close to their roost sites. 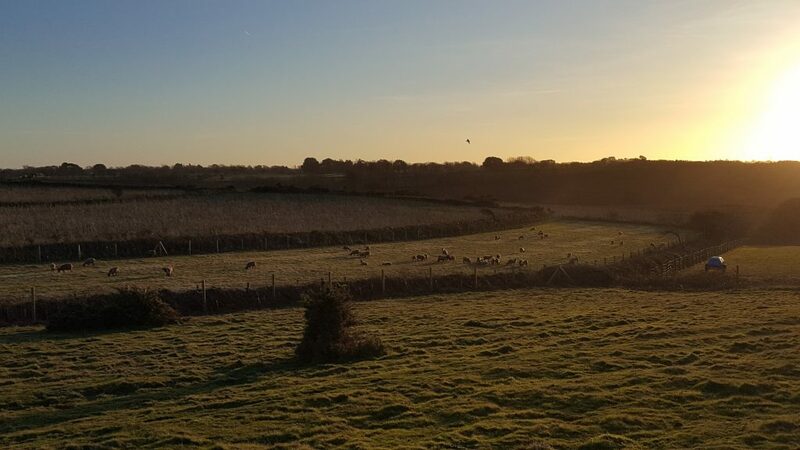 There was one intriguing public report at the start of December suggesting a new roost site. 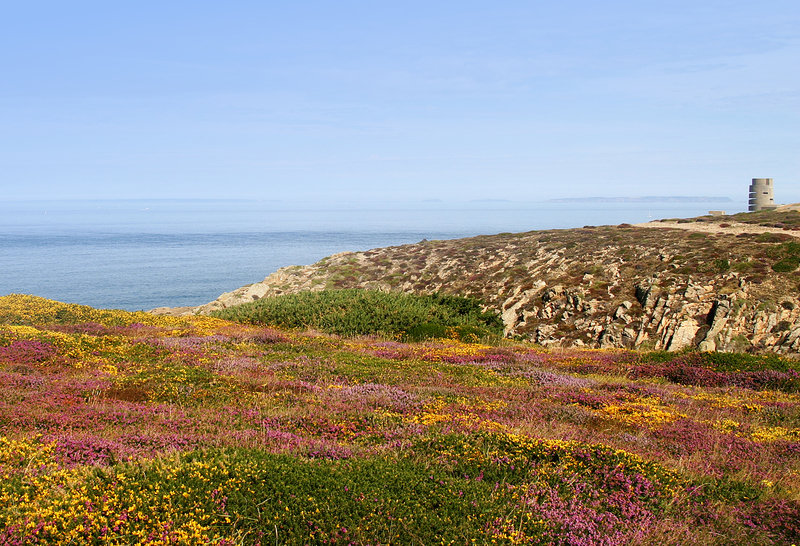 Farm workers at West Point Farm, St Ouen, had been seeing a pair of choughs in their barns around 7am each morning. At that time of year sunrise occurs around 7.40am. Was the pair roosting in the barns or being ‘the early bird that catches the worm’ and leaving Sorel before everyone else to find food out west? Choughs leaving the feed site at Sorel. Photo by Liz Corry. The day of the report, and each day since, there have been 35 choughs at Sorel for the feed. 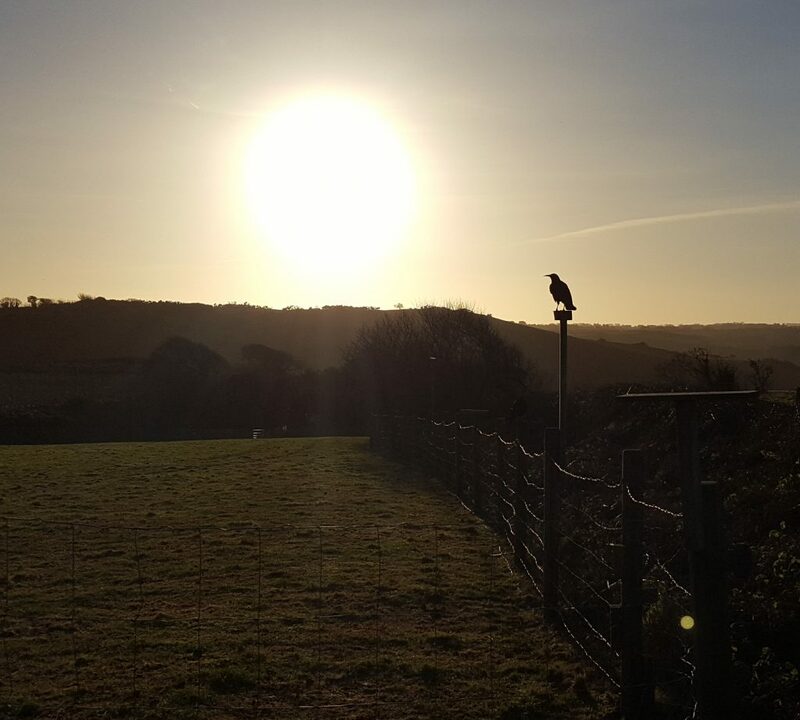 The sun sets not long after with a dozen or so choughs staying at the aviary and the rest heading east, presumably to the quarry. Taking in the last rays of a December day. Photo by Liz Corry. Another reason to stay close to Sorel is the supplemetal feed. Now that winter has set in the availability of wild food is low and the need for calories high. December has not been particularly cold – in fact there have been a few balmy days where shorts were an option (for keeper not bird). 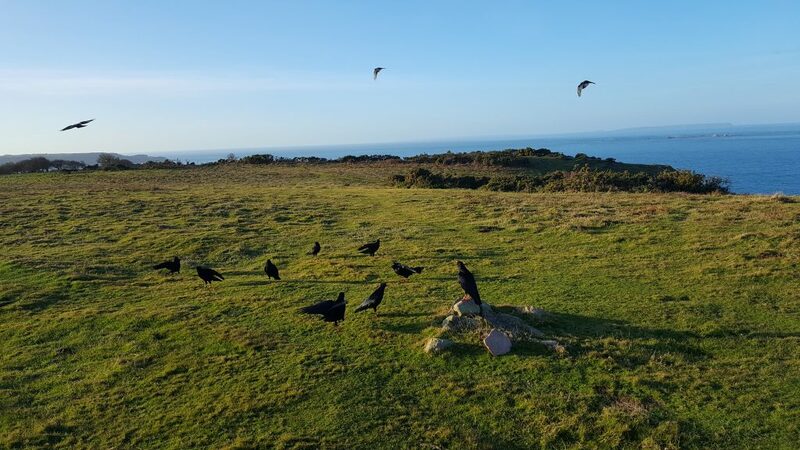 An unusually warm day in December enjoyed by the choughs. Photo by Liz Corry. However, our tiny island has taken a constant battering over the past weeks with gale force winds of 40 to 60 mph. It is bad enough walking or driving in it. Imagine being a 300g bird trying to fly or trying to stay grounded whilst searching for food in the soil. 24 hours later! (note the choughs on the roof) Photo by Liz Corry. 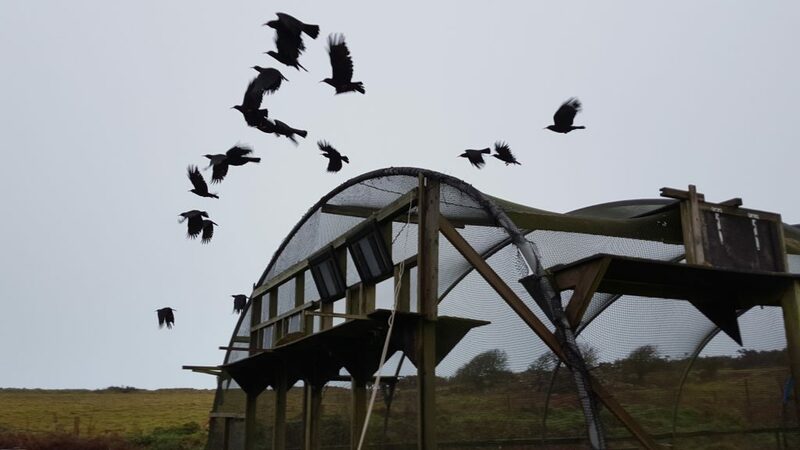 Apart from a demand for more food the choughs have on the whole faired ok so far with the bad weather. They are making the most of the sheep being confined to the aviary field. 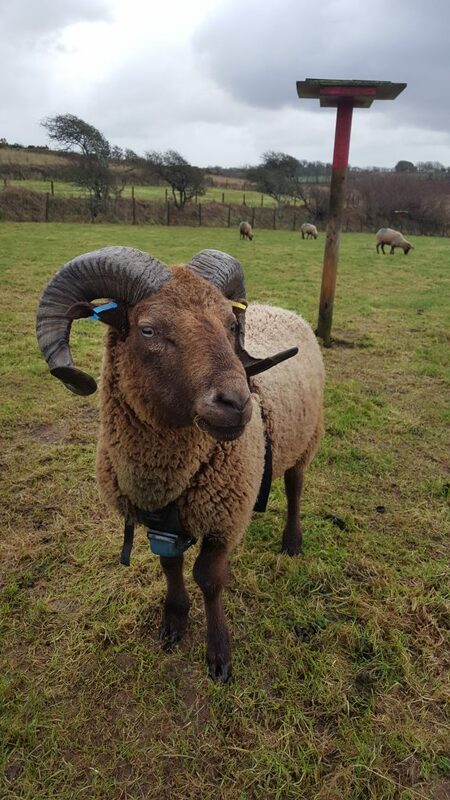 It is tupping season with one lucky ram confined to two fields with a flock of ewes. Lots of dung with maybe the odd tasty insect morsel inside. One lucky ram confined to the aviary field at Sorel for tupping season. Photo by Liz Corry. The choughs have been foraging in amongst the sheep confined to the field adjacent to the aviary. Photo by Liz Corry. There have been two cases of syngamus infection this month. Luckily I was able to trap the birds, Lee and Duke, within a couple of days of symptoms showing. They evaded capture on the first day of trying, partly due to the hatches not budging when released (if anyone can come up with a better release hatch design I will pay you! albeit in chocolate coins). 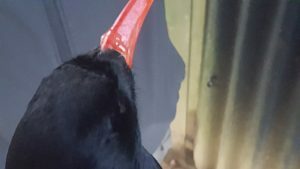 The second day their hunger in the increasingly cold wet weather spurred on their motivation for staying inside the aviary and the hatches closed. Much to the relief of the vet on call over Christmas as it was the 23rd December. 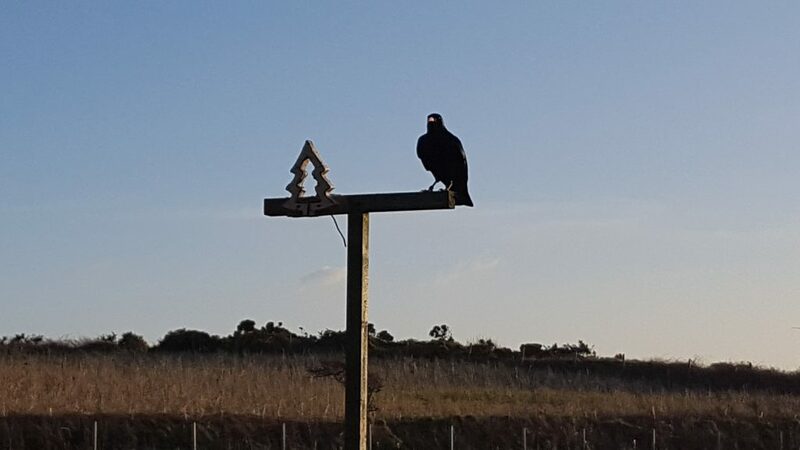 Never easy trying to trap choughs who refuse to go inside. Photo by Liz Corry. Whilst Lee had been our major cause for concern due to gaping and repeated sneezing, it was Duke who sounded the most congested once we had him in the hand. He also had a lot of mucus around his nares which we rarely see. Duke presented with mucus coming from his nares as a result of infection. Photo by Liz Corry. 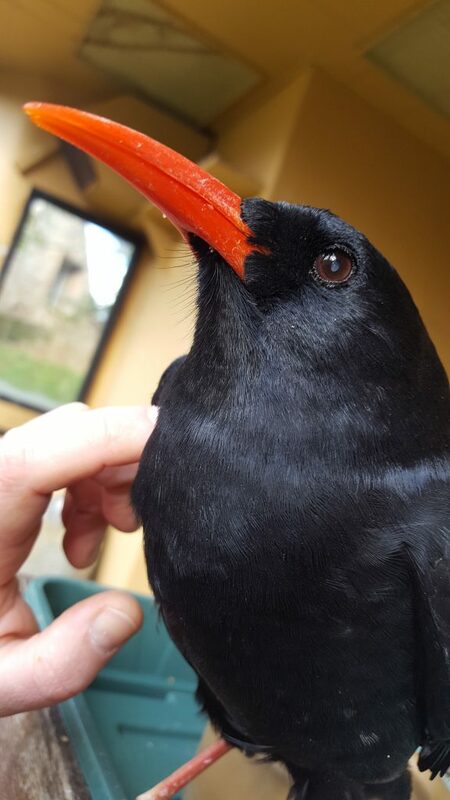 Once they had received their wormer injection they were released and left to feed on the pellet and insects at the aviary. Remarkably there have been no observations of sneezing since that day. 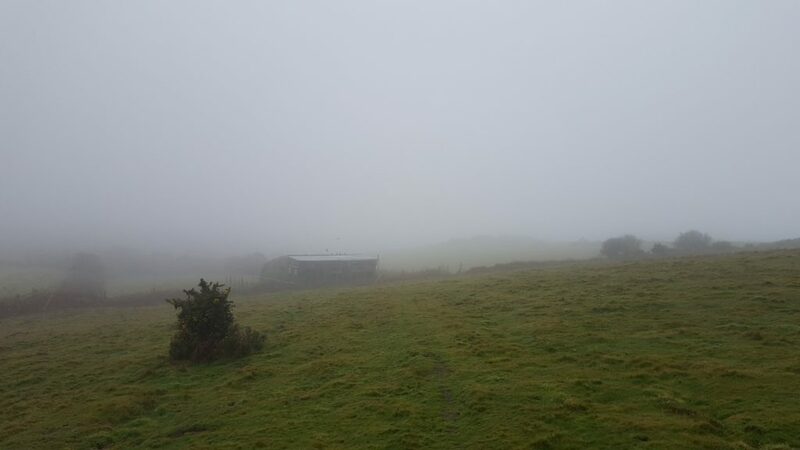 However, do bear in mind the gales/fog/heavy rain/sleet (often in the same day) have meant that there is little incentive to hang around at Sorel observing birds. We have tried. Body weights have been obtained for several of the birds. 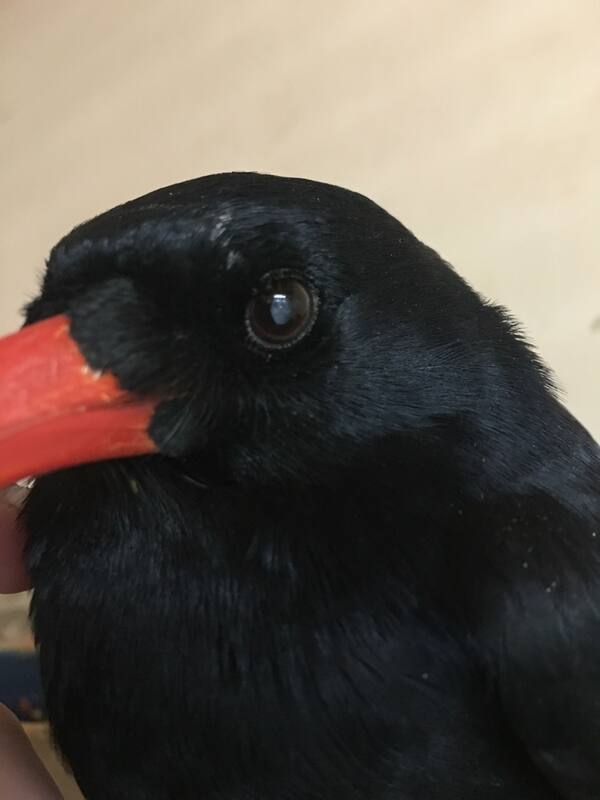 Not consistently to show any trends, but enough to know the choughs getting on the scales are not underweight. These of course will be the more confident individuals and/or ones that have low parasite loads. 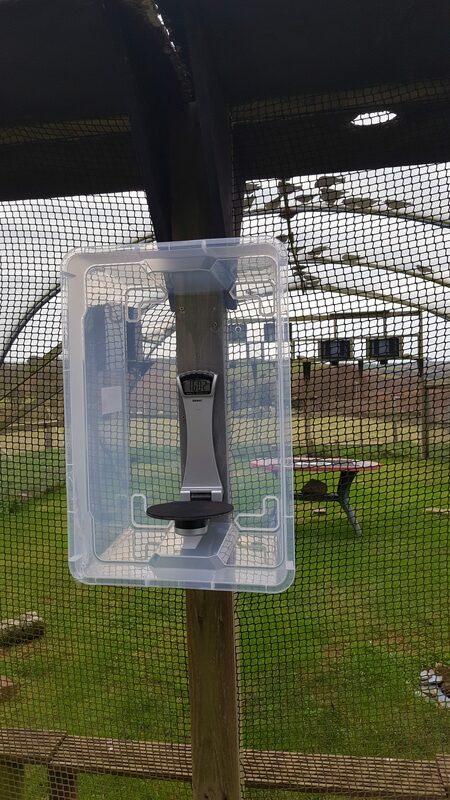 We have a new type of scale that the birds will use. A lot cheaper than the flat Kern scales (£20 versus £150). Prototype weighing station using digital kitchen scales. Photo by Liz Corry. They are not intended as outdoor scales so I have had a few attempts at weather-proofing. The current one needs improving as the birds are unsure. 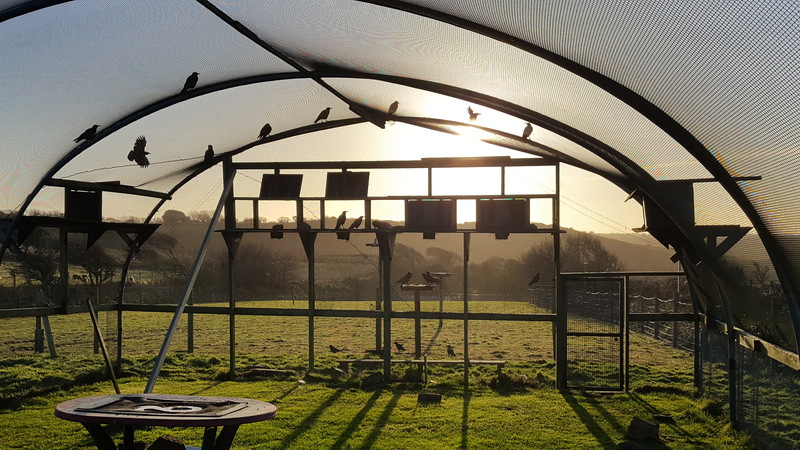 Once they have approved the design plans we can make several weighing stations to place around the aviary ensuring we cater to all of the choughs. Towards the end of November keepers at the zoo started to notice Gianna our foster mum having issues. She was crash landing when flying. Gianna is tame and she lets keepers get extremely close. She lets me open her bill to check for infections or blockages if needed. It was easy to see that the source of Gianna’s mobility problems was her eyes. Gianna’s left eye was starting to show signs of cataract. Furthermore, there was no reaction in her right eye. She was taken to the Vet Department for further examination. Photos were sent to a UK specialist who confirmed she had cataracts in both eyes. Jess Maxwell with Head Vet Andrew Routh examining Gianna’s eyes. Photo by Bea Detnon. Since the initial assessment there has been a noticably downturn in her ability to move around. Understandably as her vision deteriorates her confidence in everyday things like hopping from rock to rock has decreased. 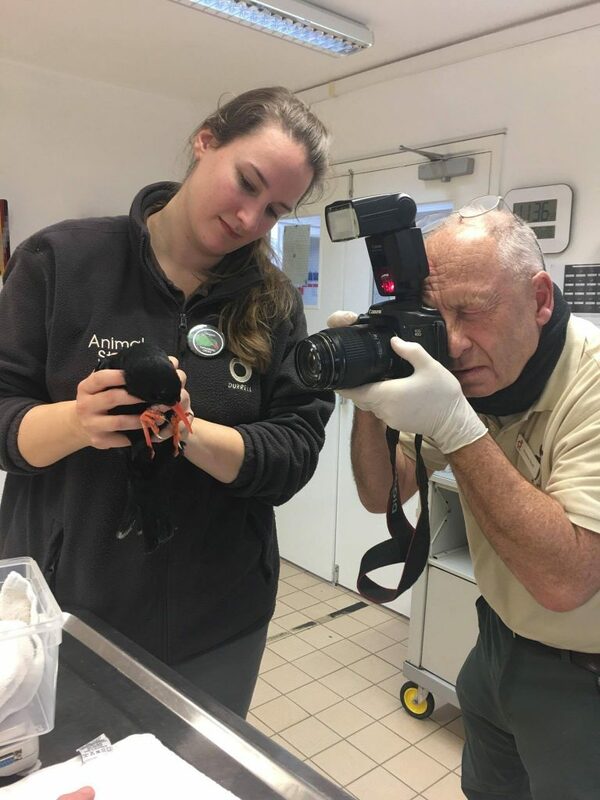 She has been moved to an off-show aviary close to the Vet Department so she can receive the best attention from keepers. Cataract forming in Gianna’s left eye at the start of December. Photo by Liz Corry. The cataract in Gianna’s left eye by the end of December. Photo by Bea Detnon. Despite everyone’s love for Gianna we have to accept that her future is murky. There is the option of an operation to remove the cataracts. As you can imagine this is very specialised, expensive, and relies on the individual being strong enough to undergo the operation. For those of you interested in avian ophthalmology click here. If the operation option is not feasible her quality of life will then need to be carefully considered. From all of us at chough HQ we hope you enjoyed your Christmas holidays and wish you all the best for 2018. Thank you for your continued support.